Levina C. Sherrill was born 19 Mar 1832 in Alexander County, North Carolina. She was the daughter of Alfred M. Sherrill and Elizabeth Moore. 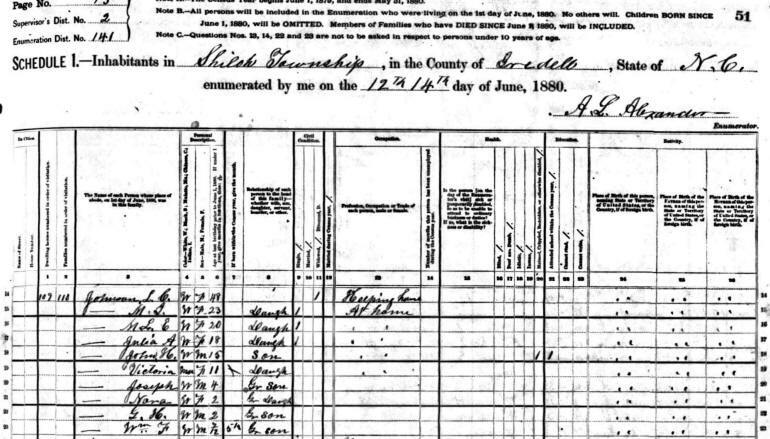 Even though only the head of the family is listed on the 1840 Iredell County Census, the ages for Alfred & Elizabeth Sherrill's family match perfectly. Based on dates of birth, the approximate family ages at the time of this 1840 Census were: John W. (2), Alfred Sharpe (4), Archibald C. (5), Hiram Bryant (10), James Guy (11) David Leander (15), Alfred M. Sherrill (42), Levina C. (8), Isabella C. (15) and Elizabeth Moose Sherrill 38). 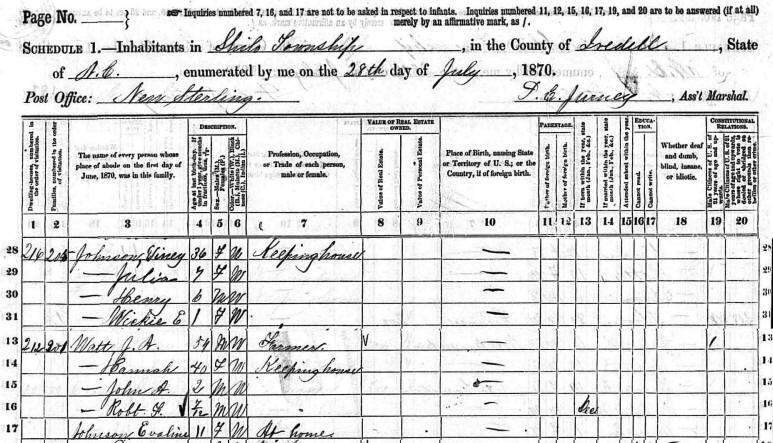 The 1840 Census also shows that Alfred & Elizabeth had a number of slaves on the family farm in 1840. There were four males (ages < 10), a male (age 10-23), two females (ages < 10), a female (age 10-23) and a female (age 24-35). Levina, or "Viney" as she was frequently called, married Pinkney C. Johnson, the son of Robert Johnson and Mary Wilkinson. Pinkney was born about 1827. As was common practice in rural areas at that time, Levina's brother, Hiram Bryant Sherrill, married Pinkney C. Johnson's sister, Mary Malissa Johnson. The 1850 Census shows Pinkney & Levina living in Iredell County when the Census data was collected in 1850. Levina's brother, Hiram Sherrill (who was still unmarried at the time), age 19, was living with the family. Levina and Pinkney's son, James Harvey Johnson, was 4-months. The 1860 Census shows Pinkney's occupation as a wagon maker. They have five children at the time: James, Freeland, Eliza Jane, Margaret and Eveline. Pinkney & Levina had at least seven children. Pinkney enlisted in the Civil War on 01 Aug 1862. He was wounded in the hand at Fredericksburg, VA on 13 Dec 1862. He returned to duty prior to 01 Mar 1863. Reported present in March - June 1863, March - April 1864, and Sept - Oct 1864. Admitted to a federal hospital on 01 Apr 1865 with a gunshot wound to the right leg. His right leg had to be amputated. He died in a federal hospital at Point of Rocks, VA on 03 Apr 1865 from wounds. He never saw his son John Henry who was born 12 Apr 1865 - less than two weeks after his death. There is no indication about what happened to the family immediately after Pinkney's death. Levina was left with seven children: James Harvey (age 15), Alfred Freeland (age 13), Eliza Jane (age 11), Margaret Elizabeth (age 7), Louisa Eveline (age 5), Julia A. (age 3) and John Henry (who was born a month after his father's death). More than, likely James Harvey and Alfred Freeland had to provide for the family. The 1870 Census shows Levina "Viney" living in Iredell County. It appears that none of the children living with her and Pinkey in 1860 are still living with her at the time of the 1870 Census. There are 3 new children: Julia, Henry and Vickie. (The 1880 Census lists Henry as "John H.") Julia and Henry were the youngest children of Pinkney and Levina, but there is no indication where Vickie came from. She was born about 1869 and Pinkney died during the Civil War in 1865. The 1880 Iredell County Census lists Vickie (Victoria) as a "daughter" to Levina. James (age 20) and Freeland (age 18) were both old enough to be out on their own. It appears that the older children were living with other relatives or family friends. Eliza Jane would have been 16 and Margaret 12. Daughter Evaline Johnson was living nearby with J.A. & Hannah Watts. She was listed as age 11. By 1880, several of Levina's (Viney or L. C.) daughters have moved back home with her, including M. G. Johnson (Margaret Elizabeth Johnson) and M. L. E. Johnson (Louisa Eveline Johnson). Vickie/Victoria, age 11, is still living with the family. In the 1870 Census she was listed as White, but the 1880 Census lists her race as "Mu" (Mulatto). The 1880 Census says that she is a daughter of Levina. It's improbable that she was a granddaughter unless it would by one of the older sons, James Harvey or Alfred Freeland - and if she was, why wasn't she living with them. It's also a possibility that Vickie could have been a niece. The 1880 Census also shows that Viney had 4 grandchildren living at the family home, too. They were Joseph, Nora, G. H. and William F. All four were listed as Johnsons, but there was no indication as to who their mothers or fathers were. The 1880 Iredell County Census shows that 15-year-old John Henry was "maimed, crippled, bedridden or otherwise disabled". Was he born that way, or did it occur as the result of an accident? ----- M. L. E. W F 20 Daughter X "
----- Julia A. W F 18 Daughter X "
----- Victoria Mu F 11 Daughter "
Unfortunately there is no 1890 Census. They were destroyed by fire. If they were available, they would provide additional information about the 20 year period between 1880 and 1900. The 1900 Census verifies the month and year of Levina's birth. Her daughter, Eliza Jane Blankenship, and son-in-law, James, were living with Levina. Levina's granddaughter, Carrie E. Idson (Carrie Lee Edison), age 7, was living with them, too, and was attending school. Carrie was the daughter of Louisa Eveline Johnson and Jim Edison. It appears her mother might have died. The Census shows that Levina, James and Eliza Jane could read & write. By 1910, James Blankenship was listed as the head of the family. Levina's name was spelled "Lavina". Her granddaughter Carrie Idson (Carrie Lee Edison, daughter of Louisa Eveline Johnson and Jim Edison) was still living with the family. Genevia Mae Johnson was actually a great-niece to James and Eliza Jane and was Levina's great granddaughter. Mae's parents were Charlie Johnson & Beulah Vernesta Johnson. Beulah's parents were John Henry "Pinkney" Johnson and Nancy Caroline Leslie. Beulah's husband, Charlie, had left her and she couldn't raise Mae by herself so she was sent to live with the Blankenship family. Clide/Clyde Kerrigan is the son of Martin Grier Kerrigan and Victoria E. Johnson. Vickie was listed as Viney's daughter on the 1880 Census - making Clide the grandson of Levina and the nephew of Eliza Jane Johnson Blankenship (and her husband James). The 1920 Shiloh Township, Iredell County, Census shows Levina and Mae still living with James & Eliza Jane Blankenship. Eliza Jane's cousin, William P. Johnson, age 64, was living with them and working on the farm. 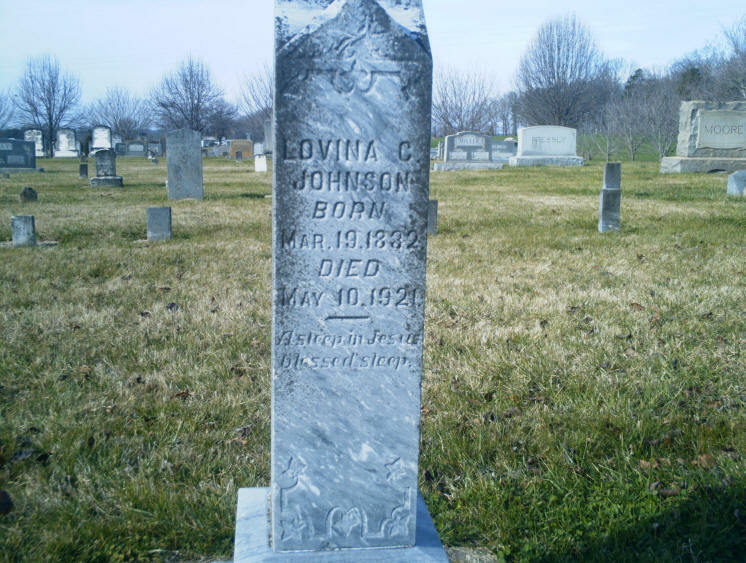 Levina C. Sherrill Johnson died 10 May 1921. The cause of death was listed as "diarrhea". She is buried at New Sterling ARP Cemetery in Iredell County, NC. 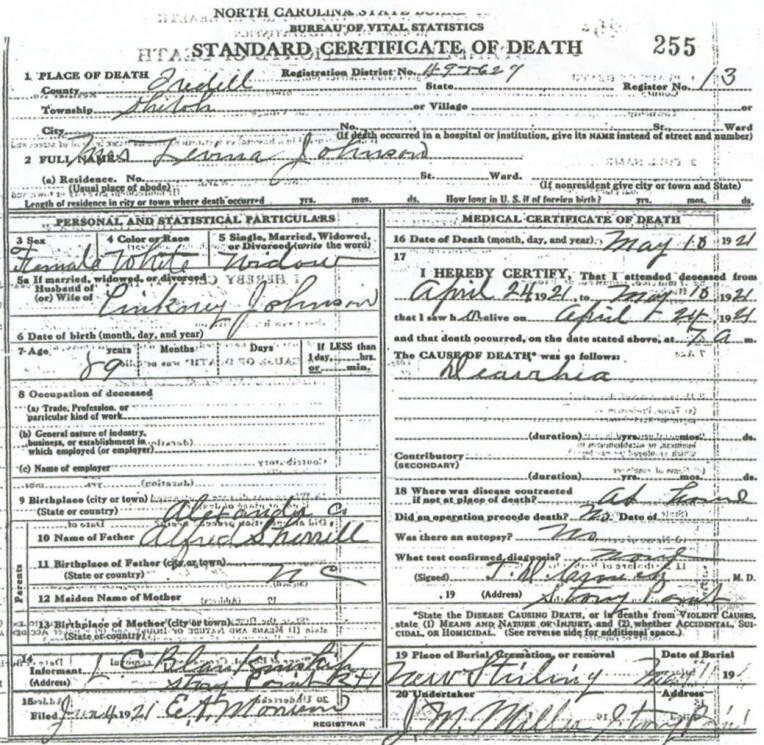 Her death certificate shows her husband as Pinkney Johnson. Her parents were Alfred M. Sherrill and Elizabeth Moose. 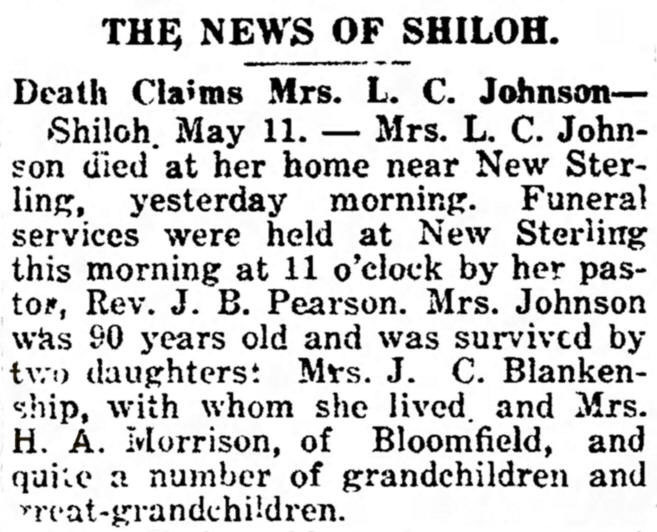 This copy of Levina's obituary appeared in The Statesville Record & Landmark on Thursday, 12 May 1921. If you have photos or additional information about Levina C. Sherrill, please contact me.